With two reigning champions and five former champions in the lineup the semi-finals promised a great deal, and they duly delivered. 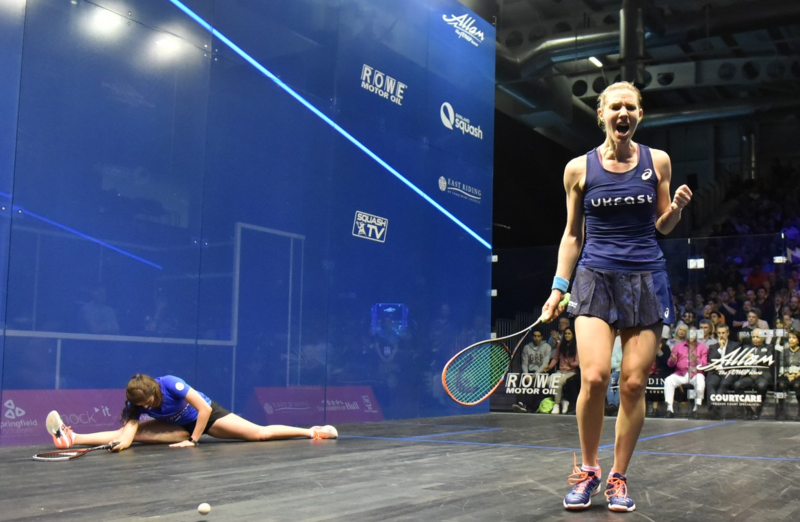 Laura Massaro came from two games down to beat defending champion Nour El Sherbini, then Sarah-Jane Perry set up the first all-English women’s final for 26 years as she stunned five-time champion Nicol David. 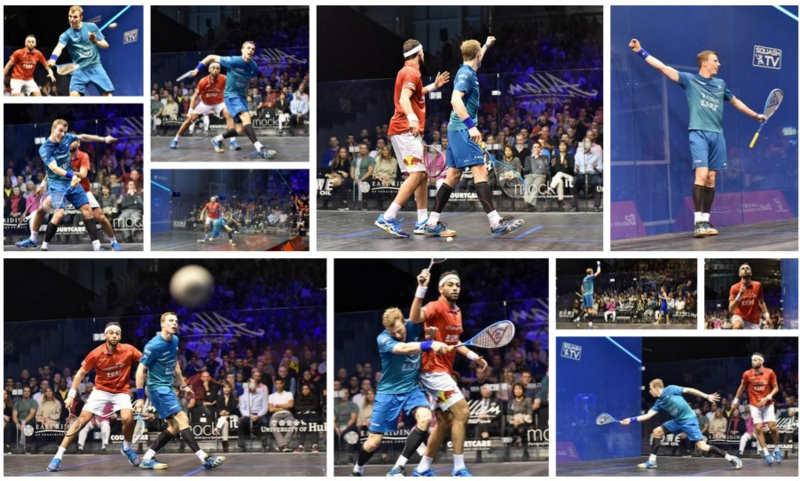 Nick Matthew put in another tremendous performance to beat two-time defending champion Mohamed Elshorbagy – ending the Egyptian’s reign as world #1 in the process – and he’ll meet Gregory Gaultier in the final after Ramy Ashour retired injured after the Frenchman took the first game. Nick Matthew made it three English finalists as he beat two-time defending champion Mohamed Elshorbagy in another tempestuous semi-final in Hull. Matthew go the better of the first game with a determined ending, then came from 4-8 down to take the second with the Egyptian making a number of unforced errors. 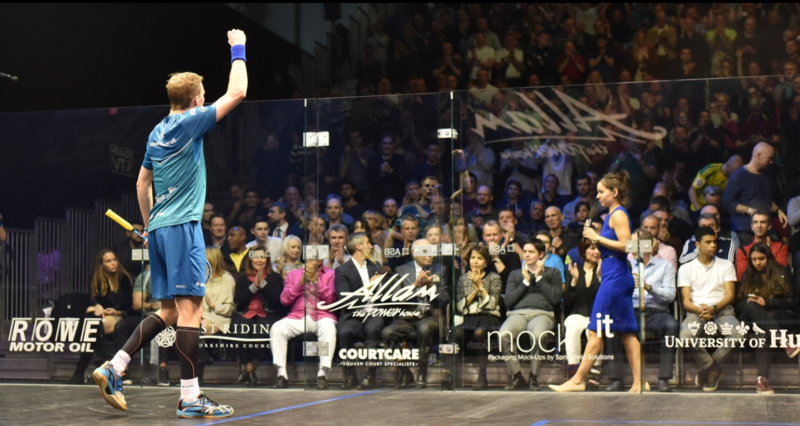 For Matthew it’s a chance for a fourth British Open title, for Elshorbagy it’s the end – for now – of his reign as world #1. 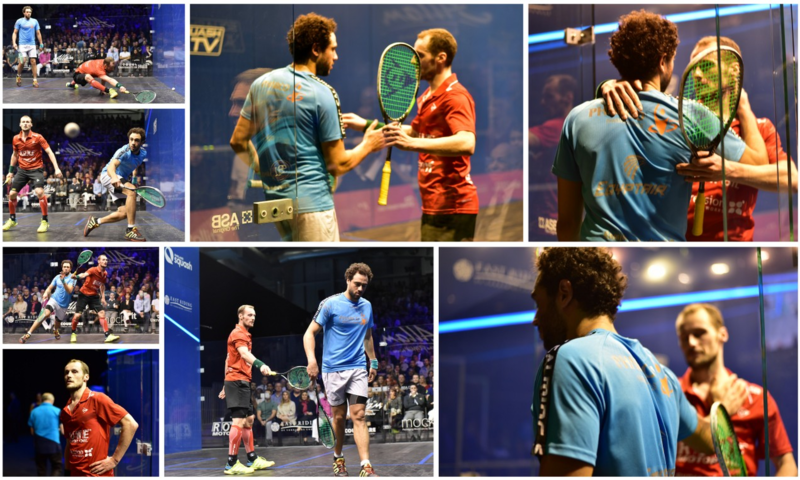 The last semi-final ended prematurely as Ramy Ashour, after losing the first game to Gregory Gaultier, retired injured. The game was a close affair, but at 9-all Ashour declined to chase down a ball to the back, then gave up the next rally as he left the court. After a few minutes he returned to shake the waiting Frenchman’s hand. 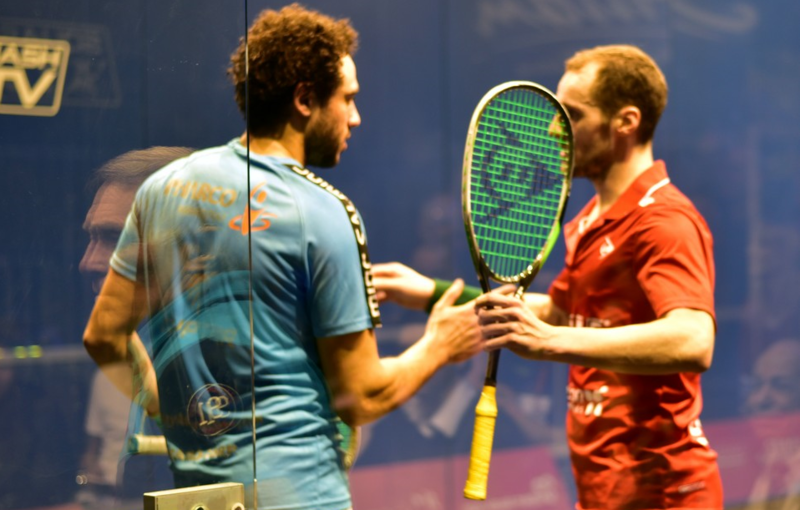 Another sad ending for Ramy – and for the tournament – while Gaultier advances to the final to take on Nick Matthew, knowing that should he win he will be the new world number one on April 1st. “The last match we played was here last year and we had an unbelievable five games,” said Gaultier. 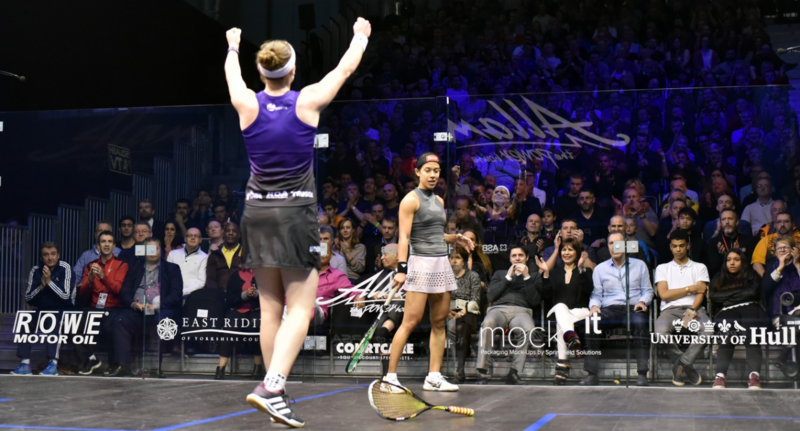 Defending champion Nour El Sherbini was in dominant form in the first two games against Laura Massaro, but the Englishwoman mounted a great comeback to wrest the title from the Egyptian’s grasp. 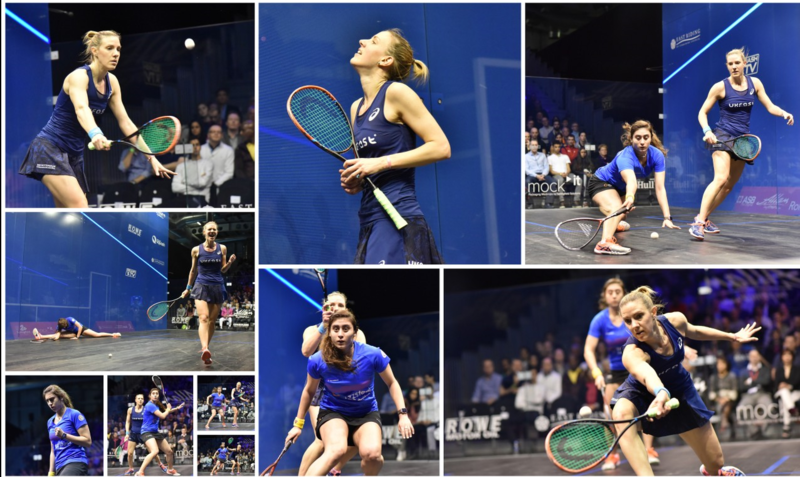 “At two nil down I needed to find something, maybe some Lancashire grit !” said Massaro, “I was trying to play from behind her, but after that I tried to play in front of her. “I think she got a bit edgy at the end, and I felt nervous too – my legs felt a bit wobbly at the start of the fifth. But I know what it’s like when you’ve been two-nil up and start losing it, and I told myself that I was back in with a chance. 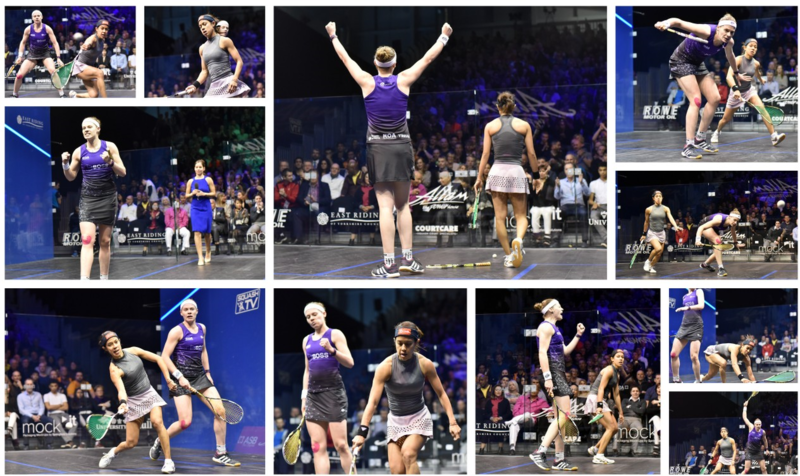 Sarah-Jane Perry played a tremendous match against five-time champion Nicol David, firing in 30-plus winners to set up an all-English final against Laura Massaro. David, so dominant against Camille Serme yesterday, couldn’t find the answers today as Perry, having regained the lead after a close third game, dominated the fourth to reach her first World Series final. “British Open finalist? It’s amazing!” she said. “Before the tournament if you told me I’d get to the final I would have dsaid you were lying. I beat Nicol last time [in Al-Ahram] but it was really close and she played better today so I had to play some amazing squash to win.